The Marvel Cinematic Universe is going to Hela. Marvel also announced that Jeff Goldblum will join the MCU as the Grandmaster, one of the so-called “Elders of the Universe” (basically a big blue giant space god). 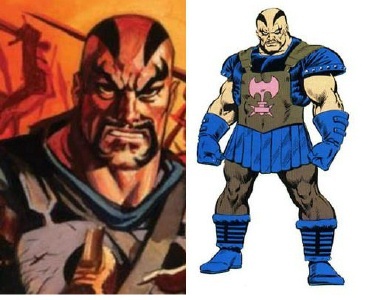 Karl Urban, who knows a thing or two about comic book movies from Dredd, will play Skurge (aka “The Executioner”) another longtime Thor nemesis who debuted in the pages of Journey Into Mystery all the way back in 1964. He’s usually portrayed as a big bald dude with an axe (who also wears an axe symbol on his chest just to make it clear he’s a big fan of axes). Finally, they confirmed that Tessa Thompson will play Valkyrie (who’s, like, a valkyrie), and that Mark Ruffalo will return as Thor’s avenging buddy Bruce Banner and the Hulk. The continuation of the epic Thor franchise will be powerful and unique, and with the additions of Cate, Jeff, Tessa, Karl, and Mark to the cast we have the makings of his most dangerous and heroic adventure yet. The sheer, raw talent each of these actors brings to the screen can’t be quantified. Having any one of them join the Marvel Cinematic Universe would be an honor, and having all of them is incredible. Hemsworth and the newcomers will share the screen with returning Thor cast members Tom Hiddleston (Loki), Idris Elba (Heimdall), and Anthony Hopkins (Odin, who was replaced by Loki at the end of the last movie). To me, the Thors have been the weakest of all the Marvel franchises; after The Incredible Hulk, both of them might be the two worst movies in the MCU. Where they’ve always excelled is their casts; Hemsworth is a great hero, Hopkins is an awesome Odin, and Hiddleston’s Loki was rightfully a starmaking turn. The new actors are all fantastic; Blanchett should make an awesome evil death goddess and Goldblum is an inspired choice to play the all-powerful Grandmaster. Hopefully this is the first Thor that’s as good as its cast. Thor: Ragnarok arrives in theaters on November 3, 2017.